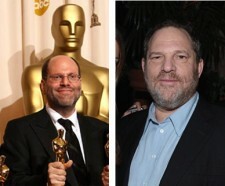 My idea of hell on earth would be to be trapped in a stalled elevator with a cell-phone-less Scott Rudin (left) and Harvey Weinstein (right). The two producers clashed over “The Reader” a couple of years back, and now they’re duking it out with the two Oscar favorites for Best Picture: “The King’s Speech” (Harvey) and “The Social Network” (Scott). Tom O’Neil analyzes the showdown.